Nice! 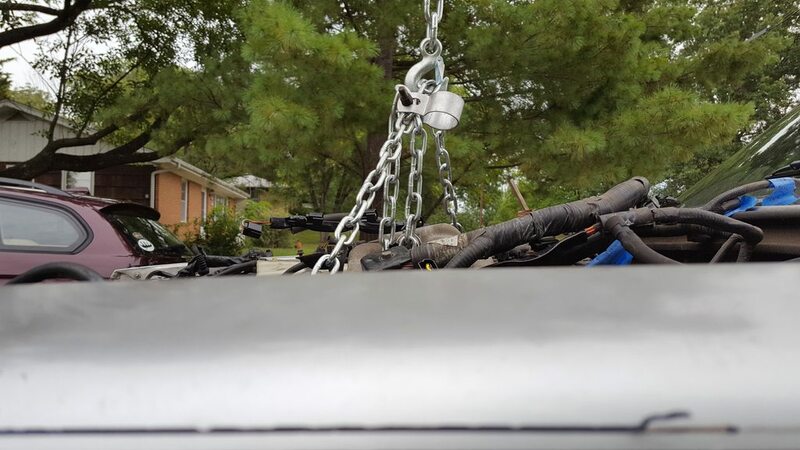 I've been looking into late model Crown Vic motor mounts - totally different from what we've already discussed, but I think they might work well in a 240. 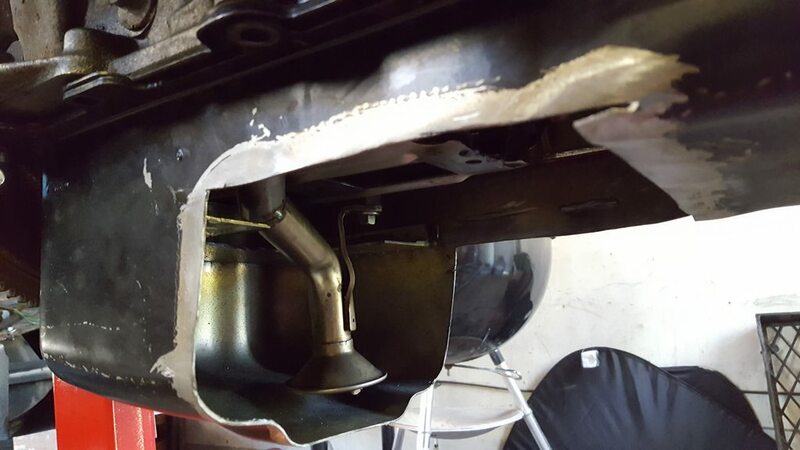 I need to consider extra exhaust plumbing but they look like they tuck up very nicely under the block. They would go straight down into the crossmember with some sort of adapter. 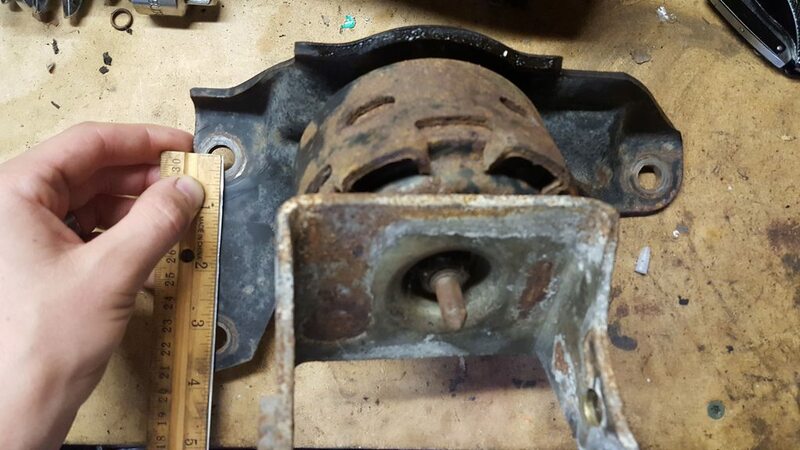 I'm working on a "Viccup" (2008 CVPI chassis under a 1964 pickup body) and thought to check out the motor mounts on that for the first time recently. If the Mustang 3V and Lincoln 4V blocks have the same bosses as the Vic 2V, then it might be a nice simple, cheap solution for us. I think I see where you're going with the late 'vic mounts. I can see the 3-bolt mounting pattern that might match up with our blocks. Heck, why stop there? Might be worth looking at E- and F- series mounts, too. I took some very rough measurements of my mounts (see pic, which explains why the measurements are rough). This is my driver side mount. The short hole to hole distance is about 3 3/16". The long hole to hole distance is about 7 7/8". Just skimmed through the "Viccup" thread. Dude(r), you are busy! That's an awesome project. I'll be doing something quite similar to your 12/23/17 post with my Mark VIII harnesses - keeping what I need and removing what I don't. 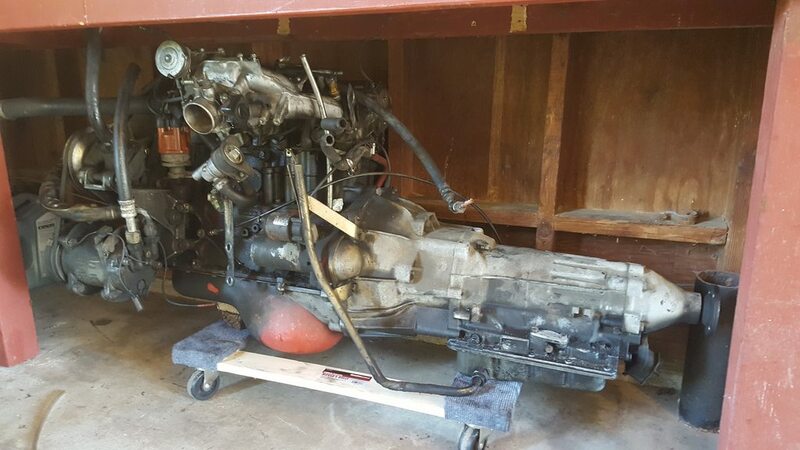 Engine and trans should be coming out Sunday. They will go up for sale in the classifieds here first before I move to craigslist. Thanks. It's me and 4 other guys working on the Viccup so I can't take credit for all the work unfortunately! 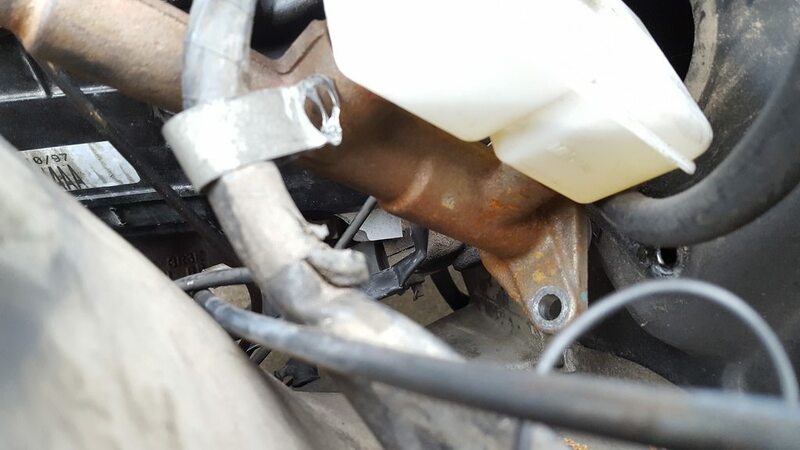 I looked at earlier SN95 Mustang 4.6 mounts which are nice and flush with the block, but would need an angled post down to the crossmember, similar to the STS machining LS mounts for the 240. F150 and E-series van mounts look very beefy and likely won't package well for my purposes. I like the Crown Vic mounts because they go straight down vertically from the angled block and end at a nice studded block at the crossmember. The Vic crossmember has pads that stick up to accept them, but we could build some little adapter blocks for the 240. You all are breaking the molds. 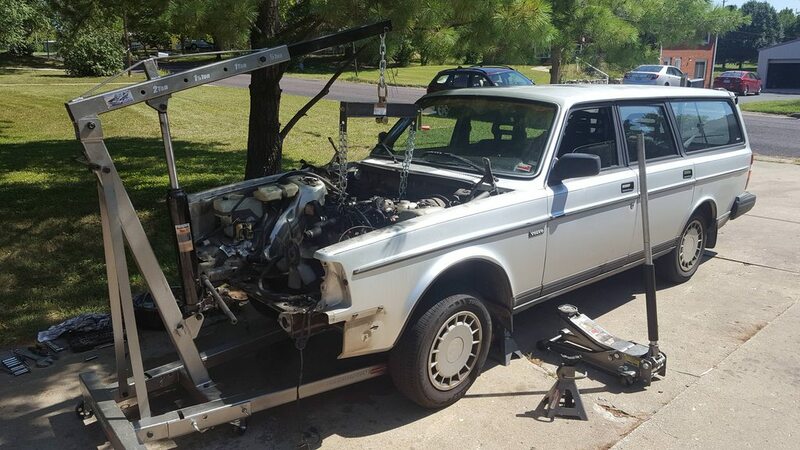 Love the fact that you have picked up on a cheap engine and rolled with it. That is a true swap win. Of course there are road blocks and difficulties, but kudos for working past them! I had a friend come by and help me. This would have been a lot more difficult as a one man job. 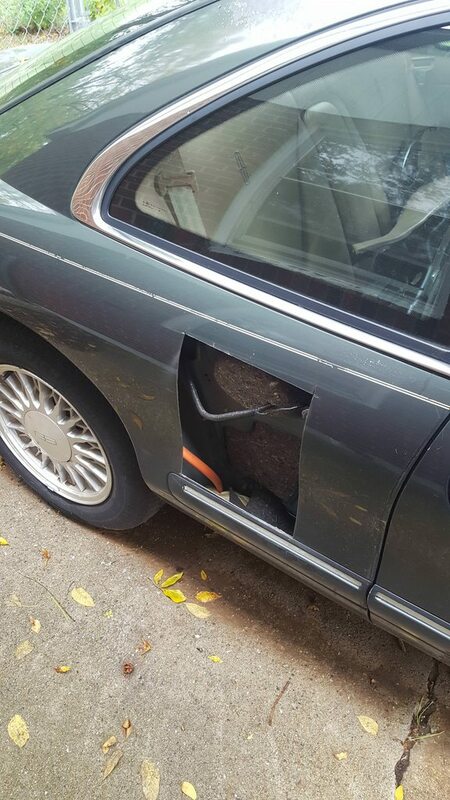 It was a pretty straightforward job and took maybe four hours with the bumper etc. already being removed. Much easier than pulling the Mark VIII engine. The only connector we ended up having to destroy was the fuel rail pressure line. It would not disconnect, so we twisted it until it broke. Other than that, everything came apart just fine. 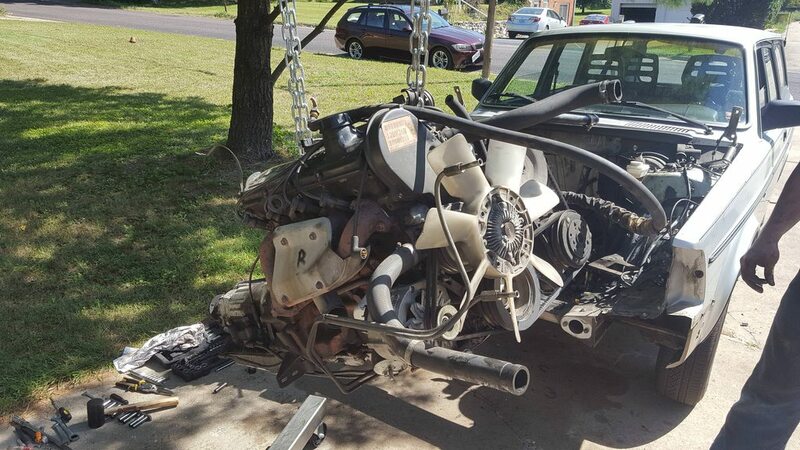 Everything up until this point has been buying cars and taking them apart. 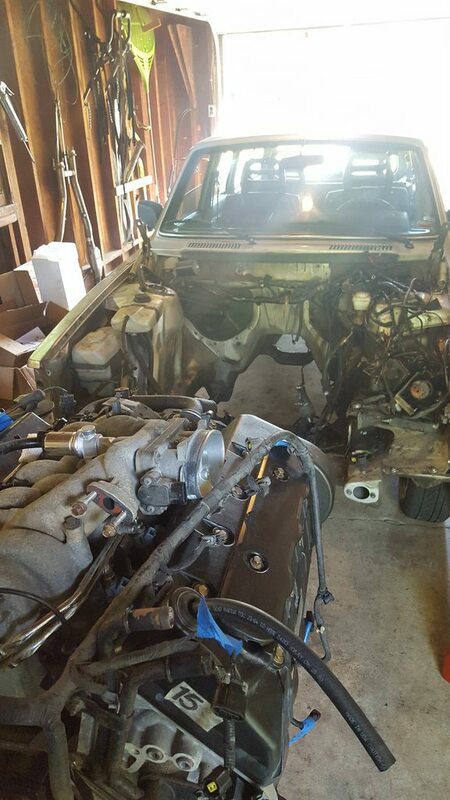 Now the project truly begins and we all get to find out if Duder and myself can use the same engine mounts! Friday I had the opportunity to do my first test fit. 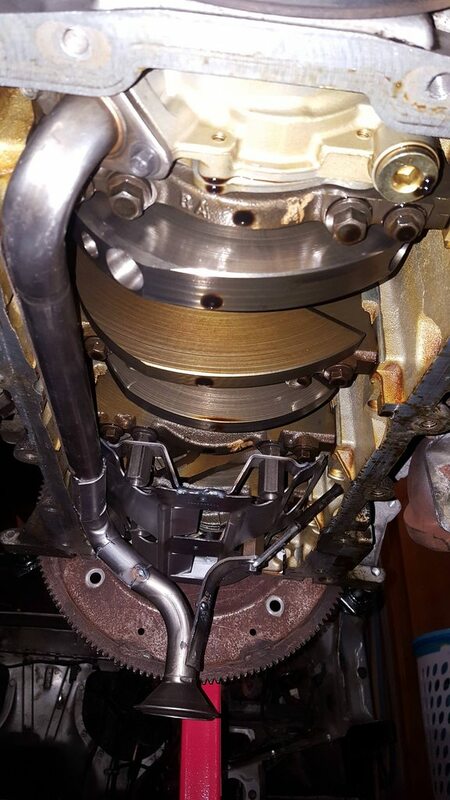 I removed the vacuum brake booster first since I knew that was going to interfere, but I quickly learned of other things that interfered as well. This was a very, very rough test fit. I didn't have the engine mounted on the hoist in a way that allowed me to move it around with much precision. I also still haven't removed any of the Volvo harnesses, so they were in the way a little bit. I also probably should have taken the 4.6 engine harness off since it's just sitting there not plugged in. Oh well. 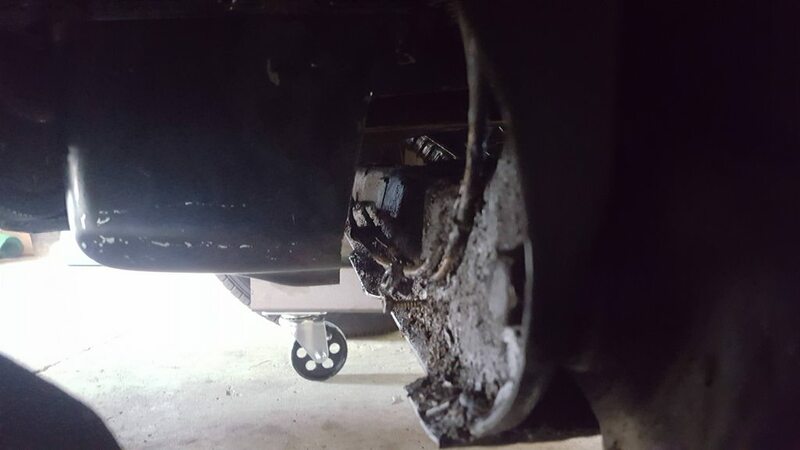 The first thing I knew about, and that was the steering shaft. That will probably have to be relocated just as the Iceland thread suggested. 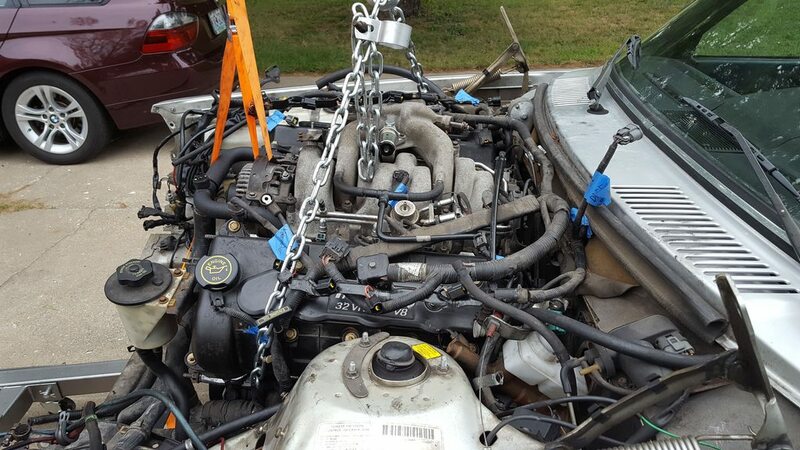 However, I noticed that it is sitting on a chunk of engine block that I might be able to trim. 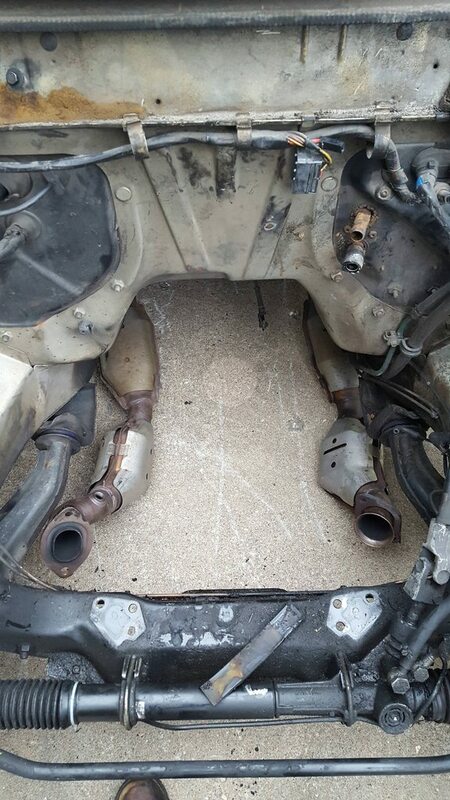 Next, the exhaust manifolds seem to dump directly into the body of the car. 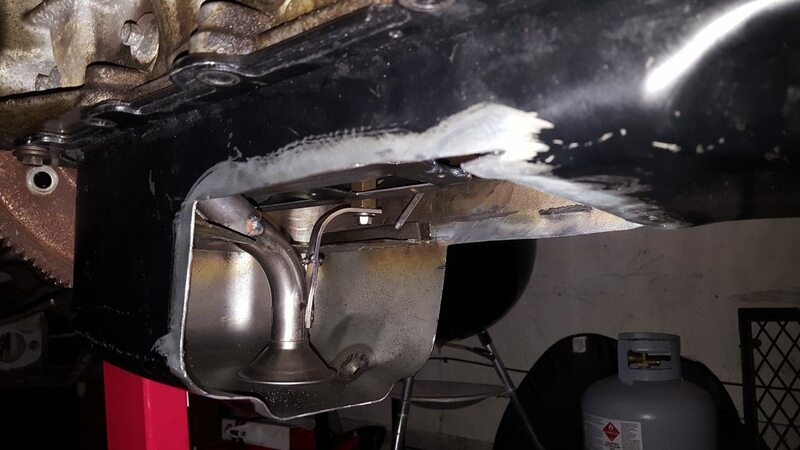 The Mach 1 downpipe assembly also does not fit very well. I think I'll need to hack that up pretty good to make it fit, and I'll potentially need to cut up the body and weld in some plates around there. 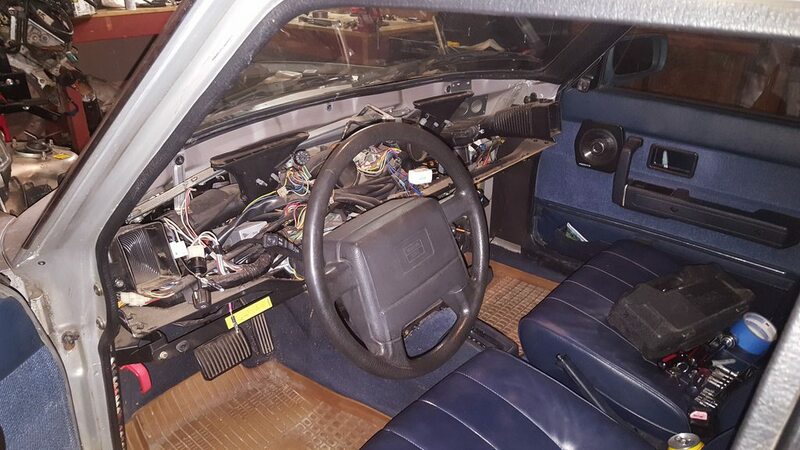 In the above picture, you can also see the heater core in/out is not in a very ideal place for the 4.6 which has its heater core in/out on the top of the block on the passenger side. It's also right were the IMRC controller sits, so I'll need to relocate that. 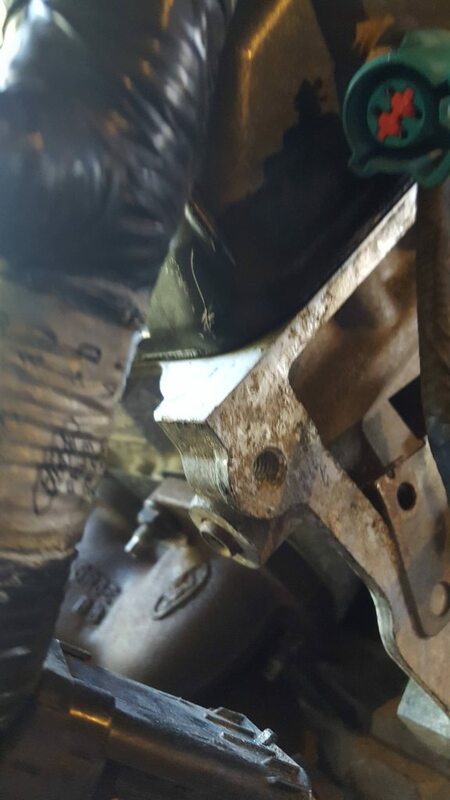 The cross member will need to be cut, or the oil pan will need to be cut. One or the other. Or both? We'll see. 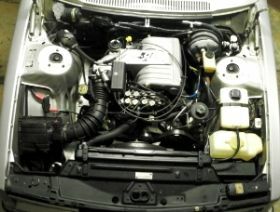 There will also be some hood clearance issues with the throttle body. 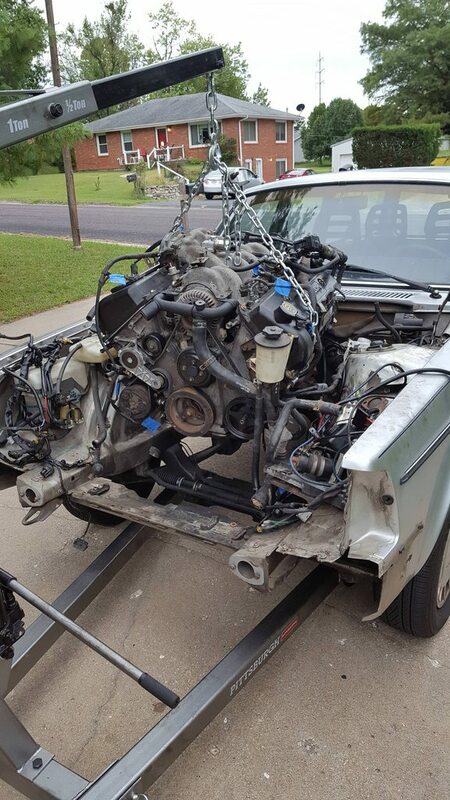 Might need to look at the Gen 1 Mark VIII intake manifold as a solution. Overall, this went a little worse I thought it would. One thing is for sure: my cutting wheel and welder are about to get some very good use in the next few months. 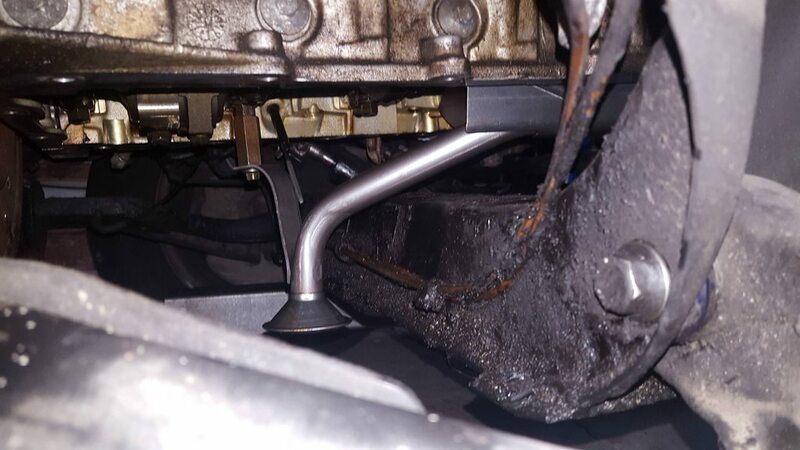 After some more test fitting, I came to the conclusion that I'd rather not modify my crossmember if I can help it, and try to make the 4.6's Mustang oil pan work in my favor. 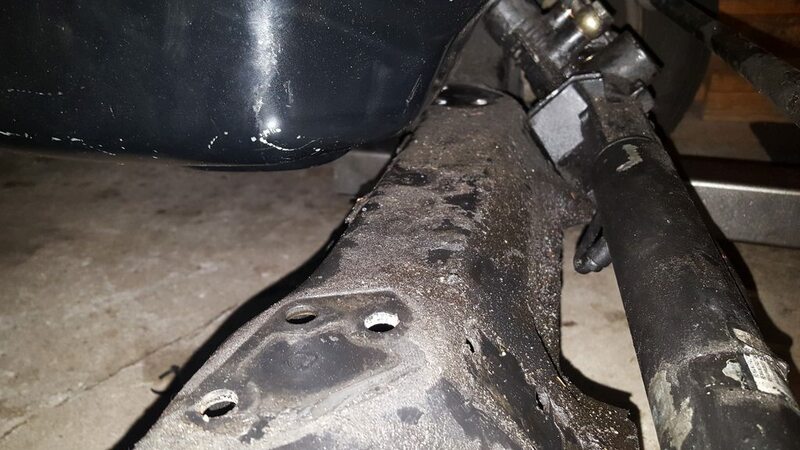 I roughly marked where the oil pan met up with the edge of the crossmember and went to town with my cutting wheel. 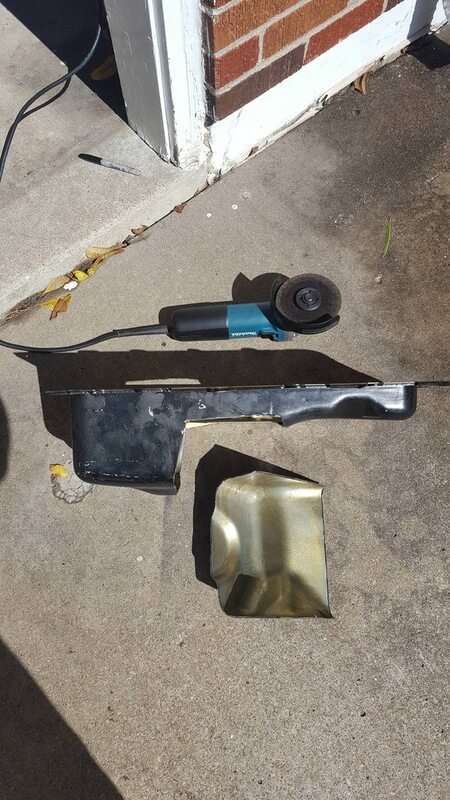 I was wondering what type of metal I would use to reconstruct the pan when a friend of mine reminded me that I have a massive pile of that metal sitting in my driveway in the form of a donor car. So I went out there and took what I need. Hopefully that will turn out and weld up nicely (it won't). To address the reduced oil capacity, I'm thinking about cutting up some more metal to make kickouts on either side of the pan. More pics to follow with that. 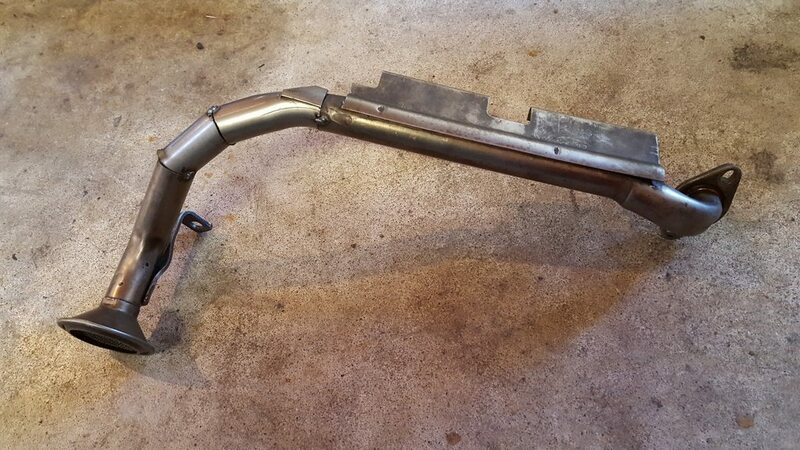 Also needing modification will be the oil pickup tube. Luckily I have a total of four tubes on hand - two for a 4V Mustang and two for a Lincoln Mark VIII. I think out of those four I'll be able to piece together one that will get the job done. The engine is able to sit in the car much nicer now that I don't have an oil pan in the way. I'm really hoping the end product allows everything to sit without any hood clearance issues. 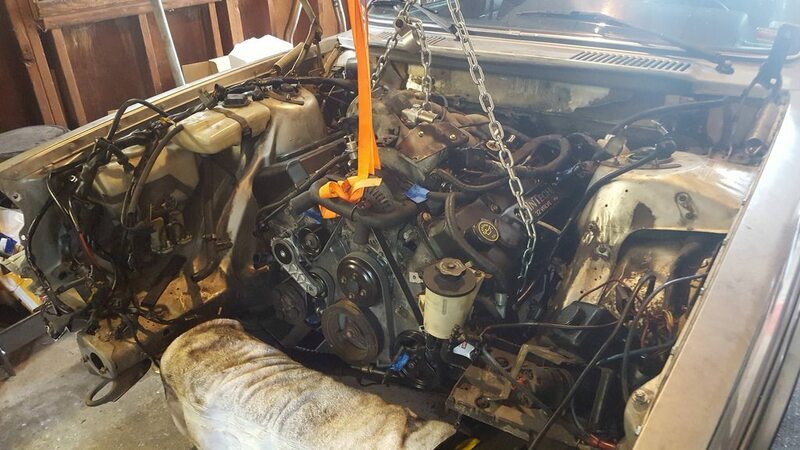 After all of that I decided to attempt putting the engine in with the transmission attached. 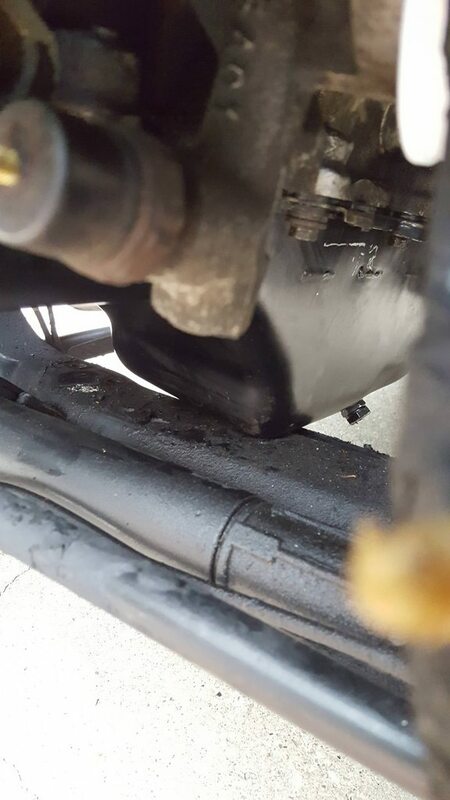 The cut up oil pan was on the engine when I tried this, and I had to remove it to get everything in the car. The transmission fit a little better than I thought it was going to, but I think I'll still need to modify the opening of the tunnel a little to allow the engine to sit as far back as possible. 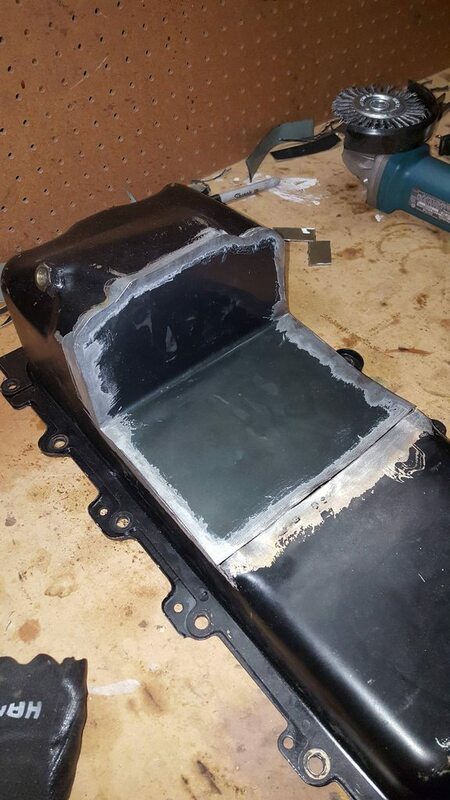 I've made some good progress with the sump setup and will be taking the modified parts to a TIG welder this week. I could try this on my own with my MIG but I know it would end horribly. 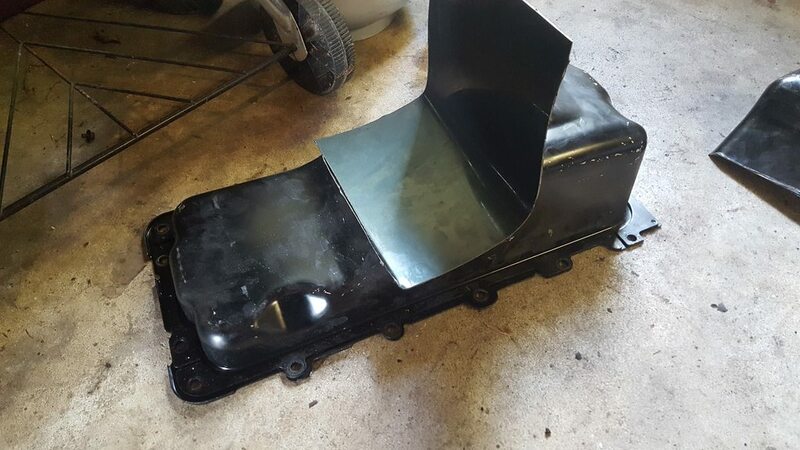 I fixed up the oil pan with tin snips, a cutting wheel, flap disc, and wire wheels. I also used paint stripper for the inside face to take off the primer. After that, I spent some time chopping up those pickup tubes and settled on a design that uses both ends of a Mark VIII tube, but uses a slight bend section and a straight with angled cuts in between to make it all fit. After tacking, I test fitted it and made some minor adjustments to make it actually fit. The end result clears everything and should work! Also you may notice that I ended up sourcing the studs needed to add the Mustang windage tray to the engine. I estimate that this "mod" is taking away about 1 out of 6 quarts of oil from the system. I plan to add this capacity back using an oil cooler or external filter adapter. I figured the kickout idea would be too much cutting for my taste. While these are out getting welded, I'm going to be looking at moving the steering shaft/column so it'll clear the block. It's not exactly clear how this will happen, but it sounds like what JoiOK did was increase the size of the hole in the firewall and shift the column as needed. Hopefully it's that simple! 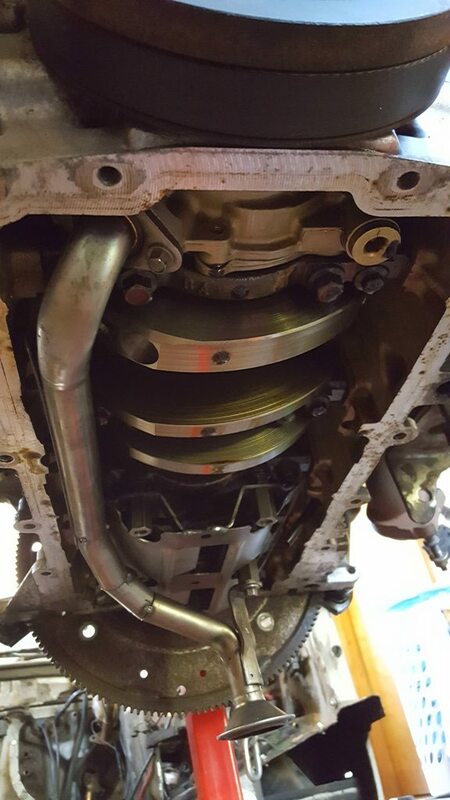 The LSx folks have added a third universal joint and a bracket to move the shaft out of the way. Do you have any links on hand referencing this mod? I have some shafts and u joints leftover from the donor that I could use. Also, TestPoint, for your 302 swap, did you carry over cruise control? My wagon has it, though it did not work when I bought it. I'm wondering if it would be easier to maintain the 240 cruise control system, or try to integrate the mark viii system which I know works. I also made a short shaft to extend the part of the shaft in the column a few inches out of the firewall before it makes its turn down to the rack. That along with the smaller diameter lower shaft gave me the clearance I needed. There are a lots of ways to skin this cat. Last edited by M.H. Yount; 10-28-2018 at 11:55 PM.. I offset the motor 1/2" to the passenger side and moved the lower end of the column/shaft as far the other way as it would go. FWIW, I didn't notice any change at the steering wheel. And if the exhaust mani stud is right there at the firewall/shaft exit - man that engine is big! Yeah...damn overhead cams. 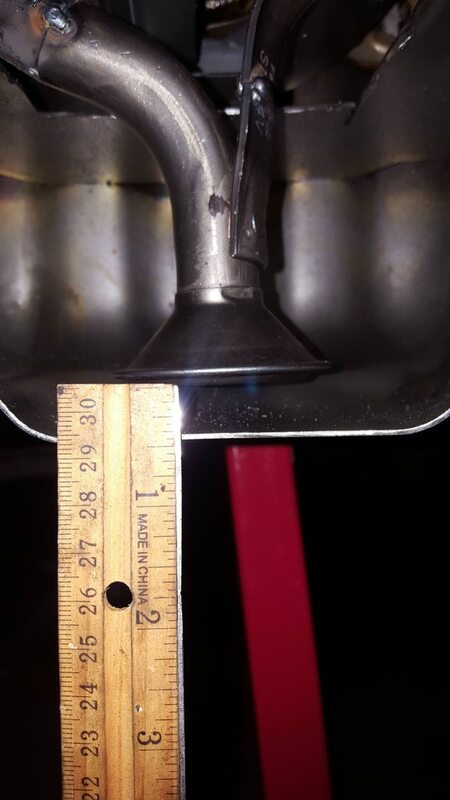 I envy you LSx folk and your overhead valves that don't take up a lot of space. I saw your vacuum booster still in place and cried a little inside. Lol. 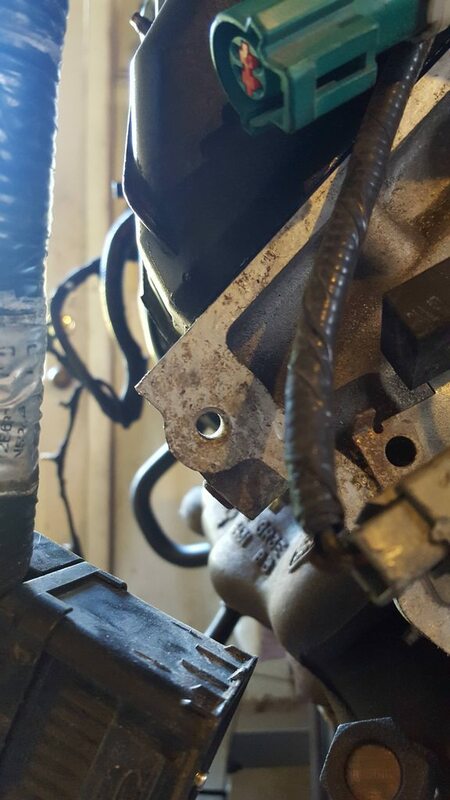 Like Chris, I too am having interference at the u joint at the firewall, except mine is with the cylinder head. The second picture in post 31 shows this. There's this seemingly random chunk of block with an allen plug going through it and it wants to sit right on top of the u joint. I want to chop it off but I need to learn why it's there first. 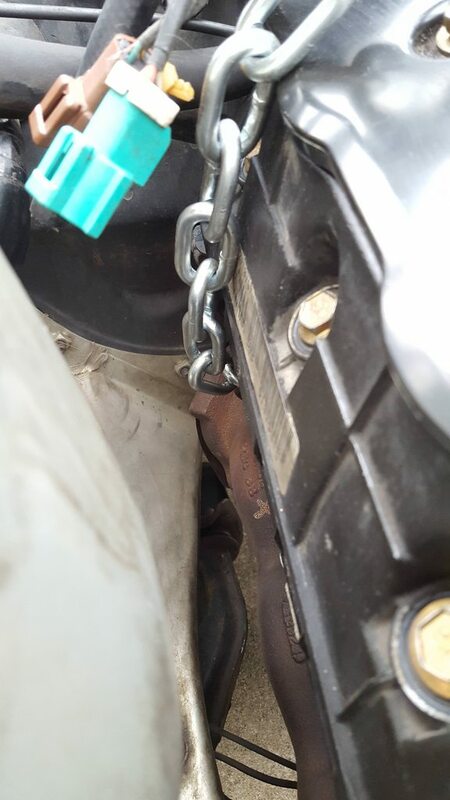 As far as I know, my exhaust manifolds and studs don't interfere but I'll double check.
. . . did you carry over cruise control? My wagon has it, though it did not work when I bought it. I'm wondering if it would be easier to maintain the 240 cruise control system, or try to integrate the mark viii system which I know works. I used the original cruise control but never got it to work well with the much more power now available. It hunted too much with rapid acceleration and then backing off. Yes, there is an adjustment for that but the range did not solve the issue. Looking at your picture above - how much clearance do you have between the pickup and the bottom of the pan? At the deepest point, about an inch. Should I be concerned? I should have researched this a little more before "declaring victory." I think I'm going to fix that before taking it to the welder. What better time to do this than when I have the convenience of looking through my oil pan?? Thanks for bringing this to my attention. That chunk of material with the plug on your head could be an oil gallery drill location. Or maybe a coolant plug for a cast-in water core. Definitely best to check into it before cutting. 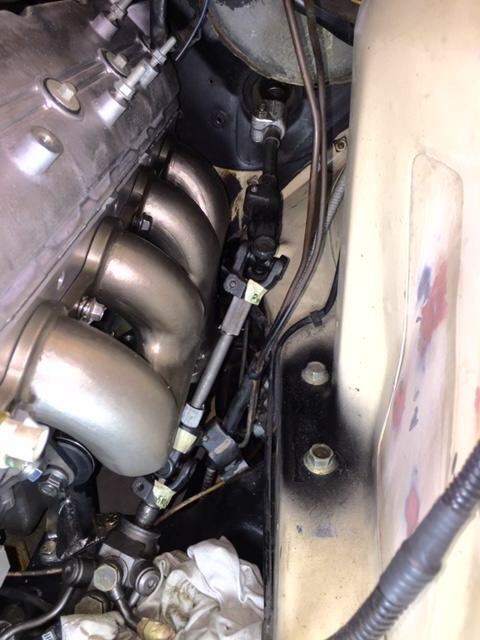 I think the main reason the pushrod small blocks including LS fit so well is that the exhaust side of the head isn't flush with the side of the block. On the Ford Modular engines both of those surfaces are co-planar and at 90 deg. to each other across the engine, and 45 deg. to vertical. On a typical pushrod V8 the exhaust flange surface is much more vertical and angled inward from the side of the block. Actually, the main reason that OHV V8's fit so well is that the heads are just much, much smaller than the OHC variants. But I know you know that. OP - yes, now is the time to fix your pickup-to-bottom-of-pan gap. ESPECIALLY since it appears that there is absolutely no baffling at all to help keep oil from moving around in response to g-loading. Here's some close ups of what's there. The chunk with the threaded thru-hole looks OK to remove - I'm guessing that back face was used for machining setup of the head at the factory. Unless of course there is some bracket or dongus that you don't have that attaches there. The lower boss with the threaded plug installed looks like a drilled oil gallery; I would proceed with caution on that one.